I started by making the brine, which was as simple as whisking together buttermilk, oil, hot pepper sauce (I used Tabasco), mustard, garlic, 1 teaspoon salt, and 1/2 teaspoon pepper in a large bowl. I then added one sliced-up onion and the chicken pieces (I used drumsticks and thighs, but you can use whatever you like) to the bowl; I turned the pieces several times to make sure they were well-coated. I put the bowl in the fridge for a total of three hours, taking it out once to turn the chicken. While the chicken was marinating in the buttermilk mixture, I made the coating. I mixed unseasoned breadcrumbs (I was a little short of the 1 cup called for in the recipe, so I added a little bit of panko breadcrumbs to make up the difference), Parmesan cheese, flour, thyme, paprika and cayenne pepper in a shallow glass dish and put it aside. Once that was done, I prepped two small sheet pans by lining them with aluminum foil and placing a rack in each pan. My preference would have been to use one large pan, but given that our oven is a little narrow, I knew I needed to use two pans to hold all the chicken. I planned to both rotate each pan a few times and switch them, moving the pan on the higher oven rack to the lower one and vice versa, so that everything would cook evenly. After three hours of marinating time, I started preheating the even to 450 degrees and got ready to bread the chicken. 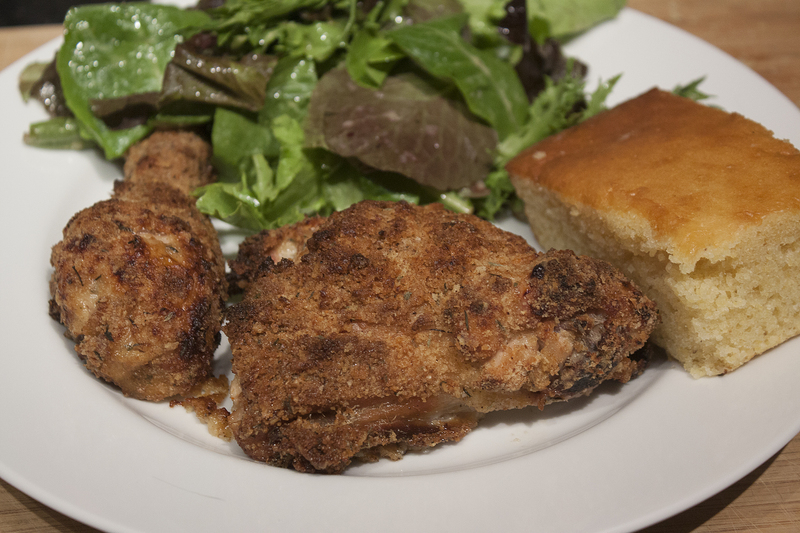 I took each piece out of the buttermilk, picked off any stray onions (I knew they would burn if I didn’t), dredged each piece of chicken in the breadcrumbs, and distributed all the pieces between the two racks. I tried to use the technique of using one hand for the wet step of getting the chicken out of the brine and one for the dry step of breading it, but, as you might expect, it still got a little messy. As a final step, I drizzled the chicken with melted butter before placing it in the oven. The idea behind trying the recipe was my desire (obsession?) to make fried chicken without stinking up our small apartment with the smell of oil. I was able to avoid doing that, but because I had to open the oven several times to move the sheet pans around, the apartment still managed to get a little smoky. I don’t know if it was the butter that fell onto the sheet pan burning or the fat from the chicken doing the same, but I wasn’t quite expecting it to happen. I think the fact that the oven was at 450 degrees contributed to the situation as well. Despite a little bit of smokiness, which was solved by opening some windows and turning on a fan, dinner was a huge success. The chicken was moist and delicious and while it wasn’t super crispy, it did have a nice crunch. The heat from the Tabasco in the buttermilk marinade and the cayenne pepper in the bread crumb coating was noticeable without being overwhelming. We had the chicken for lunch over this past weekend and it was just as good slightly cold as out-of-the-oven warm. When I make this recipe again, I plan to try to get the chicken into one pan, even if it means making the chicken in two batches. (There is no way on earth I am making this recipe without making enough for leftovers!). We loved the chicken, but I will play with the recipe a bit. I think I’m also going to skip the “drizzle with butter” step (it probably helped make the chicken a little crispier, but I don’t think we will miss it) and also cook the chicken at a more-standard-for-chicken 350 degrees instead of 450. I might also turn up the spiciness a bit and use more tabasco and cayenne pepper.